A winter garden connects Loyola University Chicago’s Institute of Environmental Sustainability (IES) and a 400-bed student residence. This state-of-the-art, low-resource consumption, high-comfort environment is designed to foster a unique, interactive, and transformative educational and living experience for students interested in sustainability. The winter garden, which houses a 3700 ft² greenhouse, is central to both the building's overall climate concept and the Institute's program. Transsolar’s climate adaptive design eliminates the need for mechanical cooling in the winter garden and allows natural ventilation throughout the year. A climate-responsive glazed façade with automated windows and shades combines with a unique heat recovery system to keep the space comfortable. This unique passive design increases natural ventilation potential in the adjacent dormitory spaces. The passive strategies carry over into the rest of the building, with an internal atrium driving natural cross-ventilation in the classrooms and offices. 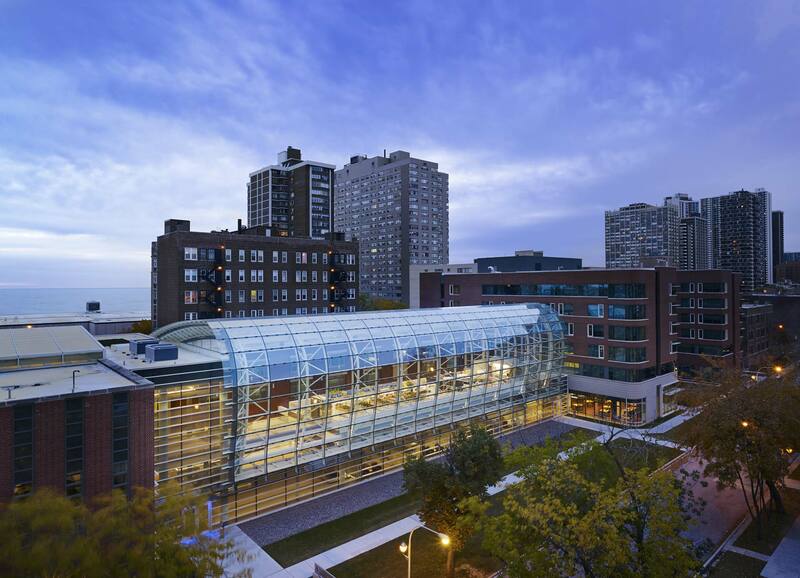 Mechanical systems – including the largest geothermal well field in Chicago - are supplemental to the passive design. Transsolar proposed and developed the conceptual design for all passive systems, mechanical strategies and renewable energy systems. The building’s site energy consumption is predicted at 52 kBtu/ft²/year - a 49% reduction compared to an ASHRAE 90.1-2007 energy code-compliant design.